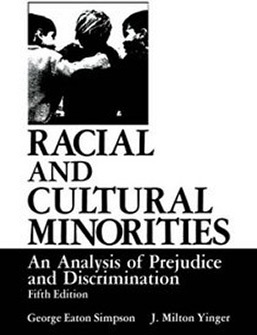 This volume deals with the problems of prejudice and discrimination in three major sections. Part one consists of ten chapters on the causes and consequences of prejudice and discrimination. In part two, eleven chapters are given to institutional patterns of intergroup relations. A third section consists of two brief chapters on prejudice, discrimination and democratic values. Although the major portion of the book relates primarily to prejudice and discrimination against American Negroes and American Jews, there are references to other American minority groups and, to a lesser extent, to minorities in Europe, Asia and Africa. In their Preface the authors state as a guiding principle that “Valid analysis of prejudice and discrimination must rest squarely on broader principles of human behavior. Every proposition concerning intergroup relations should be harmonized with, in fact a part of, the general principles being developed in social science.” Attention has been given to recent theoretical developments as well as to changes in majority-minority affairs. Recent studies in the nature and causes of prejudice have been considered and the events and problems growing out of the Supreme Court decisions on segregation are taken into account. As in almost every work of this size and scope the chapters are of unequal value. To this reviewer, the least satisfactory treatment is the chapter on “Three Approaches to Race: the Mystical, the Administrative and the Biological.” The authors seem less at home in the anthropological than in the sociological field and in the section on biological viewpoints there is a heavy reliance on books that are now out-dated. In most other sections full account is taken of recent studies. While major consideration is given to what is usually called race relations, the authors recognize that race as such throws little light on prejudice and discrimination. They see race as one of the various symbols by which groups are designated and set apart for differential treatment. George Eaton Simpson received his BS degree from Coe College in 1926, MA degree from the University of Missouri in 1927, and PhD from the University of Pennsylvania in 1934. He taught at Temple University and at Pennsylvania State University before coming to Oberlin College as a Professor of Sociology and Anthropology. He authored over 60 books and articles, including Black Religion in the New World (1978) and Jamaican Revivalist Cults (booklet, 1956). In his writings, he brought a profound knowledge and balanced judgment to the study of race relations and to the origin and character of black religions in the New World. Simpson received numerous honors and awards for his work. Among these were the Welcome Medal for Anthropological Research and Honorary Doctor of Humane Letters from Oberlin College (1976) and Coe College (1980). John Milton Yinger attended DePauw University where he studied sociology. He continued his studies at Louisiana State University and the University of Wisconsin-Madison, where he earned a master’s degree and a PhD, respectively. Yinger began his professional career in 1941 at Ohio Wesleyan University, where he taught sociology until 1947, when he moved to Oberlin College. At Oberlin, Yinger taught sociology and anthropology until his retirement in 1987. During his career, Yinger authored 13 books and dozens of articles in professional journals. In addition to serving as president of the American Sociological Association for 1976-77, Yinger received a number of other accolades during his notable career. He was the recipient of honorary degrees from DePauw and Syracuse University and was a Guggenheim Fellow, a Fellow of the National Endowment for the Humanities, and a Fellow of Clare Hall at Cambridge University in England.